Click File>Import>ACIS SAT. The Select a SAT File To Import dialog appears, as shown below. In the Files of type field, either accept the default ACIS Text *.sat or select ACIS Binary *.sat from the drop-down menu. The respective files appear in the dialog for selection. 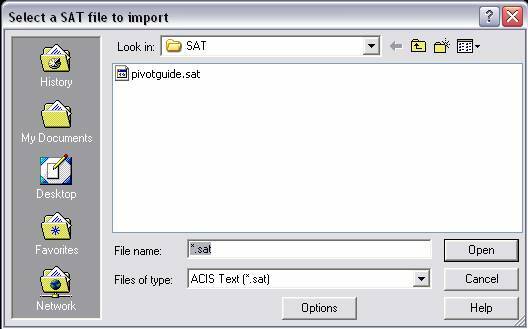 Click the file you want to import (such as pivotguide.sat in the example shown above). Click the Options button. The SAT Import Options dialog appears. Configure the dialog as desired and then click OK. The Select a SAT To Import dialog reappears.